On September 22, 2009 Black 47 met at the Carriage House in Conneticut for two non-stop days of recording. Brendan Muldowney was the Sound Engineer. A few times we nailed a song the first time through, but usually we played about three takes before we had something good enough. I didn't count the number of actual playing hours but by the end of the second day everybody was wearing thin. There was little time for overdubbing and fixing mistakes, maybe the last couple hours of the second day. By then our ears were saturated. I couldn't tell a good take from a bad one. At 6:00 the next morning, Bearclaw and I took a train back to the city. Besides being exhausted, I wasn't sure if the basic tracks would be good enough to produce an album quality performance. Bearclaw was much more upbeat than I was. Now hearing the final mix with background vocals (aren't those Orphans amazing? ), a well done master mix and the passage of time, it's become a real album. This album captures the best combination of live performance and studio production. Larry, Hammy and Bearclaw got together for a rhythm rehearsal. Here's the MP3 of Bankers and Gangsters (working title: American Tragedy) that hammy gave me to practice the horn parts with. 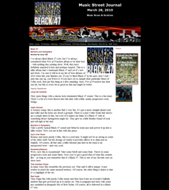 Web pages for "Bankers & Gangsters"
Black 47′s Larry Kirwan said. "Little did we know that the title would be so prophetic; still, it's gratifying to know that the material has held up. Hopefully "Bankers and Gangsters" which comes out on March 2nd will have such lasting power." ShamrockFest '10 (SRF '10) is heralded as one of the greatest St. Patty's festivals in America. We are proud to announce that SRF '10 has assembled one of the most impressive and exciting entertainment showcases of any festival this side of Ireland. This is a great festival. We arrived before the grounds opened and there were already people lined up waiting to get in. Ten bucks and all you can drink is the mantra here and as soon as the gates opened the masses were pounding the beer trucks and it never let up. Great crowd to play for. Bruce Springsteen is taking legal action against the owners of a New York bar who allegedly failed to obtain permission to play The Boss' songs. This article came out the night we were playing at Connollys and announcing the arrival of "Bankers and Gansters" We thought it ironic at the time. "Bruce Springsteen had no knowledge of this lawsuit, was not asked if he would participate as a named plaintiff, and would not have agreed to do so if he had been asked," his publicity firm, Shore Fire Media, said in a statement. "Not many people mix the brass and uilleann pipes the way we do, and when you are focused on the guitars or words you might miss this onstage. For this CD, I wanted what I heard onstage to be front and center." The band flexes their formidable musical muscles throughout the disc, most notably on "Izzy’s Irish Rose," a hilarious tale of interfaith temptations that finds the band juggling both Irish reels with snippets of "Hava Nagila" without missing a beat. "For our new press photos, a few of us got dressed as gangsters and a few of us got dressed as bankers," Kirwan mused from his lower Manhattan flat last week. Then, realizing how much bankers' bonuses have been on the public's mind in recent months, he added with a chuckle, "and you can't really tell the difference between the two anymore, can you?" The very busy Black 47, from left: Joe Burcaw, Fred Parcells, Joseph Mulvanerty, Larry Kirwan, Geoffrey Blythe and Thomas Hamlin. Larry Kirwan isn’t the first musician to write a novel. But rarely has a songwriter/author’s lyrics and prose been so closely connected. His new novel, "Rockin’ the Bronx," borrows its title from a song by the Celtic-rock sextet he fronts, Black 47, and its central characters from another Black 47 song, "Blind Mary/Her Dear Old Donegal (Sleep Tight in New York City)." "Blind Mary" is about a young man in Ireland whose girlfriend has moved to the Bronx and is living there under shady and mysterious circumstances; he wants, more than anything, to win her back and bring her home. That’s basically what the novel is about, too. 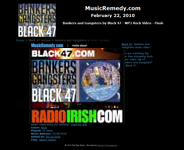 I have been waiting for Black 47 to cover this song since I first heard the original by Davy Spillane a few years ago on Larry Kirwan's radio show on SiriusXM radio... Well, its now out on the bands new CD "Bankers & Gangsters", and of course has shot to the top of my favorite song list... I went out to see them down at the Stone Pony last night, and when they played it (I had a notion they would), I had to tape it as it was the first time hearing it live... And it was great! One of New York’s most popular bands is hidden in plain sight. When Black 47 aren’t on the road, or frontman Larry Kirwan isn’t putting on a play (he’s written over ten at last count) or he’s off on a book tour, the band plays Connolly’s in midtown on Saturday nights. This week the legendary Irish-American rockers are doing a benefit for Haiti on the 24th at Connolly’s at 7 PM with a roots reggae band. Terry George, the Academy Award nominated director/writer of the film "Hotel Rwanda" will host "Relief for Haiti: Island People Supporting Island People." Musical guests include Moya Brennan, Black 47, Jameson’s Revenge, Morning Star, Clay Ross & Matuto, Seanchai and Unity Squad, as well as a Haitian band Brother High Kanaval and Creole jazz band Mozajik. Readers will include National Book Award winner Colum McCann, Amy Goodman of Democracy Now, Malachy McCourt, T.J. English, Michael Patrick MacDonald and others. One island people will help another through a multi-cultural evening of music and readings to raise money for the relief effort in Haiti. Hosted by Irish American Writers & Artists, Inc. (IAW&A), the Wednesday, Feb. 24 event gets underway at 7 p.m. at Klub 45, the music venue above Connolly’s Pub on West 45th Street near New York’s Times Square. 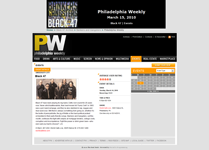 Black 47 is scheduled to play the Half Door on Sisson Avenue in Hartford at 9PM Friday. The Half Door gig was snowed out. Rebel Frequencies: "Bankers and Gangsters" released this Tuesday! Bankers and Gangsters holds a great deal in common with 2008's Iraq in that it is pitched at keeping its finger on the pulse of working people. The anger against the bailouts and frustration that exists among ordinary folks runs deep on this album. "Bankers and Gangsters" (United for Opportunity). Ever-scrappy NYC rock band with Irish-expat frontman finds plenty of material in current events. Black 47, "Bankers and Gangsters"; Dee Dee Bridgewater, "Eleanora Fagan: To Billie With Love From Dee Dee"; Citizen Cope, "The Rainwater LP"; Jamie Cullum, "The Pursuit"; Jason Derulo, "Jason Derulo"; Raheem DeVaughan, "The Love and War MasterPeace"; Peter Gabriel, "Scratch My Back"; Danny Gokey, "My Best Days"; Groove Armada, "Black Light"; John Hiatt, "Open Road"; Holmes Brothers, "Feed My Soul"; Shooter Jennings, "Black Ribbons"; Lifehouse, "Smoke and Mirrors"; Blake Shelton, "Hillbilly Bone." Kirwan treats listeners to tales of life in New York City ("Long Hot Summer Comin' On") and his Irish homeland ("Red Hugh"). Along the way we're introduced to characters of whom all manner of unfortunate circumstances befall. From a young woman chasing trends ( "Celtic Rocker") to a search for the recordings of Jimi Hendrix last gone horribly awry ("Long Lost Tapes of Hendrix") to the "Black Velvet Band"-meets-Jean Valjean of "Bas in Eireann", Kirwan keeps us riveted with his narrative. If anyone is left standing, it’ll be Black 47. Black 47 returns with its 14th release, Bankers and Gangsters. "This time it was more about creating a balance between the joyous and the thoughtful," said front man Larry Kirwan. 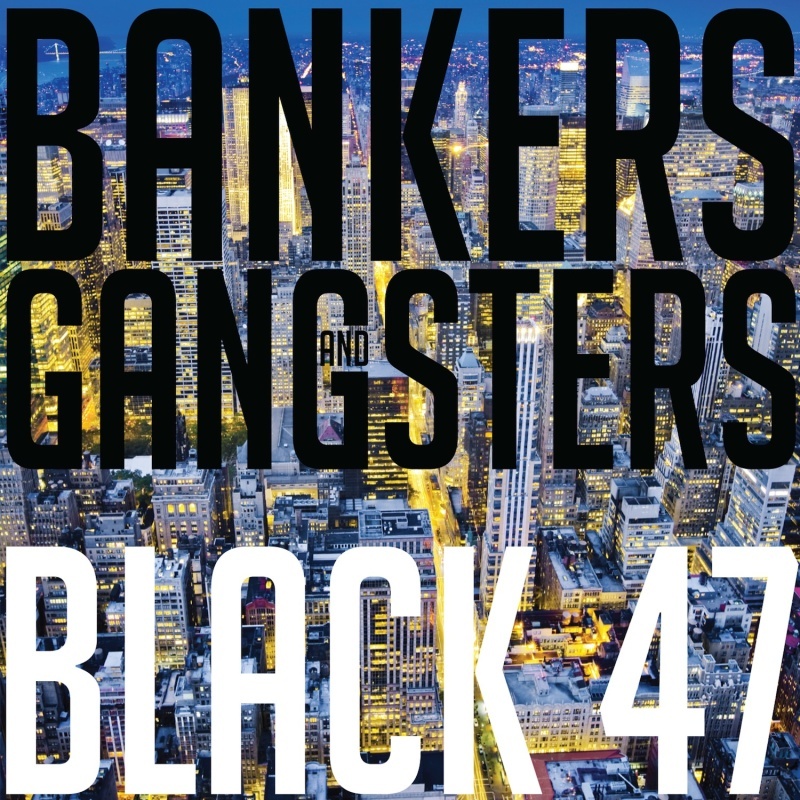 As ever Black 47 has its finger on the pulse of the country with a title track commenting on the ongoing financial crisis and employing the band’s trademark black humor. Black 47 - Bankers and Gangsters Haven't heard from them in years, but I liked their early stuff. Bankers and Gangsters reels and rollicks over the whole stretch of biting, comical, political, immigrant-laced terrain the band has owned for 20 years. They cast a punk-Proustian eye on the heady lost days of late-1970s New York on "Long Hot Summer," then, on "Celtic Rocker," give a sarcastic yet amiable wink to the tatted plastic Molly now moshing in the front row. March 3, 2010 Haitian band Brother High Kanaval rocked the house at Connolly’s on 45th Street last Wednesday ahead of Larry Kirwan’s Black 47 and Seanchai and the Unity Squad led by Chris Byrne. But the big news of the night was the $107,000 raised by the Irish American Writers & Artists in aid of relief for Haiti, which is still reeling under the impact of the devastating earthquake of Jan. 12. All right, I’ve got one for you! What do John Lennon, James Connolly and the Irish Arts Center have in common? "It’s about time he got on my wavelength," says your man up in Pearl River. "Don’t I adore the very ground the Beatles walk on, and what could be better than the Wolfe Tones singing about the "Irish Rebell," and sure haven’t I been meaning to drop by the Irish Arts Center this twenty years or more." Ah, isn’t it a wondrous thing when reader and writer connect! All three, indeed, have one man in common – Brian Heron, a grandson of Connolly who inspired Lennon to write Luck of the Irish, and once upon a time persuaded the city of New York to grant a building on West 51st Street to the fledgling Irish Arts Center for a mere pittance a year. Interview with Larry and press release for the gig on March 14, 2010 at the World Cafe Live in Philadelphia. Combining traditional Celtic instruments like the accordion and fiddle with pounding drums and acoustic guitars, this Celtic rock movement will be on full display this month at Showcase Live in Foxboro, with separate concerts by Hothouse Flowers (March 12), Black 47 (March 16) and Enter the Haggis (March 17) to celebrate the St. Patrick's Day season. Connecticut has been a major beneficiary of Kirwan’s multi-media hyperactivity. Last week in Hartford, Black 47 played the Half Door and Kirwan gave a reading at the Mark Twain House. On March 11, the band gigs at Toad’s Place while the reading is just down the block at Labyrinth Books. The newly established Fr. Mychal Judge Center is sponsoring the New York City band in honor of Fr. Mychal Judge, who perished during the terrorist attacks on Sept. 11, 2001, and was a fan of the group. "The band was a favorite of his," said Larry Sorokes, director of the Fr. Mychal Judge Center. "I thought it would be fitting to have them back to campus as we unveil the new center this semester." With a sound bursting with uilleann pipes, tin whistles and an impressive arsenal of brass, Black 47 is the unofficial band of St. Patrick's Day. "Celtic Rocker" is a light-hearted look at the subculture that has grown around bands like The Dropkick Murphys, Flogging , The Young Dubliners, and, yes, Black 47. And then there’s "Long Lost Tapes of Hendrix." Check my Terrell’s Tune-up column this Friday for more on that. Story of the San Patricio Brigade, a band of predominantly Irish (although there also were a good number of German) immigrants, many of whom deserted the U.S. Army and joined the Mexican army to fight during the Mexican-American War. Excitement still surrounds each gig, and magic can be found onstage. "I guess it's because we've always done what we've felt like doing onstage and off. We've always taken our moods onstage. You didn't have to smile if you didn't want to. . . .
"The idea was to work out whatever you're going through onstage," he says with a laugh. "And that seems to have worked out." Hopefully you're doing your part to get your liver in shape for St. Patrick's Day. We'll help your ears get up to speed. Black 47 have been playing its big-band, Celtic rock sound for 20 years now. Moya Brennan was the obvious choice to host "Music of Ireland: Welcome Home," airing on PBS stations. Brennan interviews a who's who of Hibernian stars _ from the Chieftains' Paddy Moloney to U2's Bono _ in the documentary, which charts the course of contemporary Irish music. "When I tell people that Celtic music is 40 years old, they can't believe it," says Brennan later that afternoon. "They think it's ancient." The film begins with the genre's Big Bang moment: the Clancy Brothers performing in their matching Aran sweaters on The Ed Sullivan Show in 1961. Announcing the gig at Showcase Live in Foxborough, MA. This is a great venue build next to Gillette Stadium, home of the New England Patriots. And here's a video taken at the gig in Foxborough, MA at Showcase Live. Here are seven ideas on how to celebrate the day in New York City and nationally. For Larry Kirwan, the leader of New York's hometown Celtic-rock house band Black 47, it's all about the stories and the characters. Kirwan finds inspiration for his songs everywhere, including Post headlines about Bernie Madoff for the title track "Bankers and Gangsters" to a breakfast where he heard a wild story on which he based the song "Long Lost Tapes of Hendrix." On that inventive and adventurous song, the uilleann pipes are played in homage to Jimi's guitar style. The 13 tracks on this record have an us-against-them attitude that suits Kirwan's loopy Dylan-esque vocal style. For Larry Kirwan, the leader of New York’s hometown Celtic-rock house band Black 47, it’s all about the stories and the characters. Kirwan finds inspiration for his songs everywhere, including Post headlines about Bernie Madoff for the title track “Bankers and Gangsters” to a breakfast where he heard a wild story on which he based the song “Long Lost Tapes of Hendrix.” On that inventive and adventurous song, the uilleann pipes are played in homage to Jimi’s guitar style. The 13 tracks on this record have an us-against-them attitude that suits Kirwan’s loopy Dylan-esque vocal style. Hopefully you have a few drinks in you by now and are enjoying the St. Patrick’s Day festivities. Here is some great music to put you in the Irish drinking mood. There are other political and historical songs on the album but they tend, as usual with Black 47, to deal with characters, and tell their story. For instance, “Rosemary” deals with the assassination of Rosemary Nelson, the Northern Ireland Civil Rights lawyer; and “Red Hugh” looks at the life of Red Hugh O'Donnell who fought Queen Elizabeth I back in the 16th and 17th centuries. Oddly enough, I was finally able to understand and delineate O'Donnell's character by studying Ahmad Shah Massoud, the leader of the Northern Alliance in Afghanistan. This might be one of our less political albums, probably because IRAQ was just so focused on one issue. What are the experiences that influenced you in writing the music on Bankers and Gangsters? The title is a bit misleading--it would seem to suggest that all the songs are about the current financial crisis, whereas just the title track deals with that issue. On that song, I just use some humor, both lyrically and musically, to point out the human cost of the crisis and how the actions of a few people can have a deep impact on the rest of us. But in many ways, we're using the actual musical arrangement to highlight the situation rather than just the lyrics. Last Saturday the band returned to the area for a post-St. Patrick’s Day gig at Troy’s Revolution Hall. In honor of the occasion, they played “Banks of the Hudson” from their debut album, inspired by the hall’s waterfront location, to toast the river that unites upstate with down. They also paid tribute to Troy’s Riverfront Park statue of Irishman and temporary Troy resident James Connolly, the only monument of its kind in the United States, with a ripping version of “James Connolly,” their fiery ode to the slain workingman’s hero. Irish American rockers Black 47 have travelled a long, raucous road since starting out twenty years ago in a seedy Lower Manhattan tavern. They've been on MTV, on the cover of Time and Newsweek, and on most all the TV talk shows, and they continue to tour constantly. Their songs have been used on movie soundtracks and in Irish history courses at colleges and schools, and their fans just keep coming back, show after show, bringing new fans along, spanning generations and geography. A few years ago, during a period of band transition, leader Larry Kirwan confided, "We're going more musical, if anything." That they did. Bankers and Gangsters, their fourteenth CD, is solid proof of that. If you’ve liked Black 47 in the past, don’t wait – pick this one up, you’ll love it. If you have yet to sample their particular blend of Celtic rock, then get this thing as a first sampling. Sure, Fire of Freedom has their one hit, but this is every bit as good as that and might be better. But then a funny thing happened. Well, actually, it wasn’t funny at all. It was the Cheney years. 9/11. Thousands of New Yorkers dead (including some of the band’s fans). The trumped-up search for WMDs. The end result was two studio albums (2004′s “New York Town” and 2008′s “Iraq,” based on letters from fans stationed there) that reflected the strange times in which they lived. They were more somber in tone overall, more reflective affairs — well-done albums, but not necessarily the type of discs that will spur people to want to listen (for a parallel, look how long it took for an Iraq war film to connect with the public, and then it took an Oscar nomination) or buy in mass quantities. I always like to compare B47s Larry Kirwan to an Irish-American, Bruce Springsteen. Like Springsteen, Kirwan has a special ability to bring alive ordinary people in both song and story and turn their ordinary lives into 3 minute anthems. Though, I would claim Larry has the advantage of the bigger canvas of NYC for people and sounds to work with. Nowadays, you can’t swing a cat at an Irish festival without hearing some band doing their best to blend traditional Irish melodies with bone crunching power chords nowadays. Announcement of the gig at Paddy Reilly's with Barry Devlin and Jim Lockhart from the Horslips. Their sound after so many years has become quite effortless, and they play together as if they are all blood-related. Their causes bind them together and their talent makes that a great listen. Those who have followed this band for a long time will appreciate this CD and those who have never heard them can get a great feel for their music through listening to “Bankers and Gangsters”. New York's Black 47 turns 24, and the band's years of wisdom shows through in their newest CD Bankers & Gangsters. The musicians in the band frame singer Larry Kirwan's lyrics in that Black 47 orchestra-rock band style. The women of Screaming Orphans bring a feminine voice to many of the tracks, along with Kathleen Fee and Christine Ohlman. Announcement of Blue Ocean Music Hall gig we did on 9/18/2010. The dressing room was built on stilts over the ocean. We ate dinner at high tide with the waves crashing underneath us. One of the past-times on those long van rides is to figure out how many babies have been born as a result of black 47 gigs, then how many Black 47 fans have died since we started. The difference always seems to be about the same, although somehow either way, there's alcohol involved. Black 47 found their gritty, rock sound while playing Manhattan pubs. During their 20-year history, the band has released several albums, with "Bankers and Gangsters" being the most recent. A review in Rolling Stone describes the band as "Usually most comfortable playing loud and live with upraised fists and chunky guitar riffs in local hangouts - [the album] explodes with declarations of gnashing street poetry punctuated with wailing uilleann pipes, Joe Strummer-style chord chops and Bourbon Street sax sojourns." Review of a gig at the Saratoga County Fair by Kirsten Ferguson. Black 47 does Spinal Tap. "We’re very excited about bringing this wonderful festival to Southern Vermont," co-organizer Laura Moore said. "We’re thrilled to be able to bring top performers to the area and we expect a sell out crowd." Among the internationally renowned headlining performers are New York’s own Irish rock band Black 47, Shana Morrison (daughter of legendary Van Morrison), vocalist Maura O’Connell, the Young Dubliners, Belfast natives McPeake, and 10-time Irish National Fiddle Champion Seamus Connolly. Larry Kirwan and the boys perform "That Summer Dress" from their "Bankers and Gangsters" cd on the vessel "Half Moon" cruising the East River on a spectacular NYC evening. August 28, 2010. Part of the Tapestry of Nations Ethnic Festival series brought to you by Jersey City Department of Cultural Affairs. Live music by Black 47, the Eamon Ryan Band, Celtic Thunder and The Itinerants. On 10/23/2010 we did a benefit show to help rebuild Blackthorne Resort’s banquet hall after a propane tank from a steam table heater exploded. The opening song from the Sons of Anarchy last night, Episode 8. It’s “Big Fellah” from a New York based Celtic rock band, the Black 47. This page was up for a short time. I installed my own flash player so you can still listen to or download "The Big Fellah". RuTracker.org from Russia: Very cool page with all the albums listed. Since it was impossible to whittle this down to the original 50 we were originally shooting for, we went for 100. This was another great year for Celtic music. Celtic musicians from around the globe continue to release great Celtic MP3s through the Celtic MP3s Music Magazine. The CDs this year are better than ever too. Now that we are firmly settling into 2011, it’s time to take a quick look back at all the great Celtic music we heard in 2010–and there was a lot of it!